The Chilli chicken gravy recipe is a popular Indo – Chinese dish. 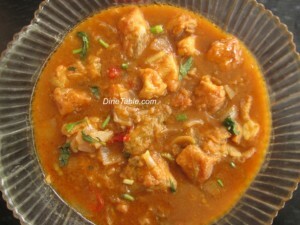 Chilli chicken gravy is a spicy non-vegetarian item can serve with fried rice, noodles, chapati, etc. The taste of tomato sauce makes this chilly chicken ( ചില്ലി ചിക്കൻ ) gravy a different taste. This item will be one of the favorite dish for one who loves Chinese dish or chicken as favorite. This dish can serve in special occasions and surprise the guests. Grind together chopped ginger garlic, kashmiri chilly powder, pepper powder, egg, cornflour, soya sauce, maida, to a fine paste by adding 2 tsp of water. Marinate the cleaned chicken cubes with this paste and keep this for 20 minutes. Heat sunflower oil in a pan and deep fry the chicken pieces and keep aside. Heat some oil (you can use the same oil which is used for frying chicken pieces) in a deep pan. Add chopped onion, chopped green chillies, capsicum and salt. When it becomes soft add chopped ginger and garlic. Saute for 3 minutes. Add kashmiri chilly powder and saute for 2 minutes. Add 1 cup of water and when it starts boiling add soy sauce, green chilly sauce and tomato sauce and mix well. Add fried chicken pieces and mix well. Cover and cook till the sauce is reduced and chicken pieces are coated well with the sauce. Add chopped spring onion and chopped celery. Take a glass and mix 1 tsp of corn flour and 2 tsp of water. Add this to the cooked chicken and mix well. So that you will get a thick chilly chicken gravy. Tasty chilli chicken gravy is ready. Served with fried rice or noodles.